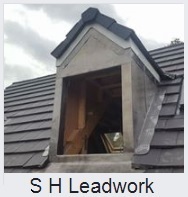 SH Leadwork - Fascia/Soffits/Guttering, Roofer based in Church Crookham, Hampshire. Thank you for looking at our page. We are a Local Lead Roofing Specialist based in Fleet, Hampshire. Our Aim is deliver a low cost effective service of the highest quality. Lead is one of the best proven building materials available, if fitted correctly by a Leadwork Specialist it should last 40-120 years!